Unreasonable Rocket: Something new more in line with a HPR than orbital launcher. 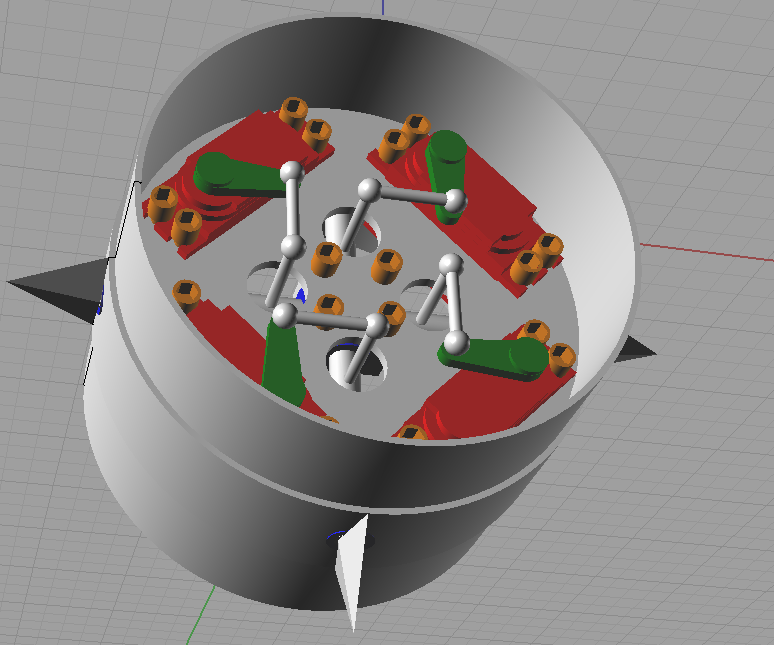 Why not two gimbaled HPR or peroxide motors? That works in space as well. why 4 servos? Why not one connected to a disk, rods up from the axles through holes in the disk, the disk on a simple bearing mounted in the center. A simple bushing on the disk for each. Disk rotates, all four axles turn in the right direction, one servo instead of four. Should be lighter. Actually this is for 3 axis of control. One could get away with 3 servos, but 4 is conceptually easier to do. If there's any substantial torque back through the system, all those 90 degree bends are going to give you a lot of backlash, I would think. 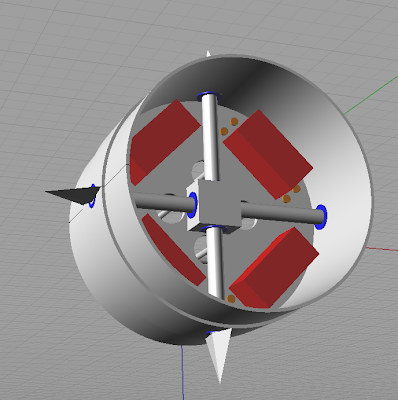 Why not just mount the servos so that their axes are perpendicular to the wall of the tube, and mount the control surfaces directly to them? There are pretty standard ways of making missile fins. Those are ball joints, very little play, hard to get the direct shaft alignment right. This might interest you, acouple of students down under here have done something similar http://www.ucrocketry.com/, not alot of info on their site but you get the gist of it. I've had a look their hardware and its a similar set up to your concept. If you need carpet cleaners in Birmingham contact us.We Provide professional carpet cleaning birmingham,West Midlands,Solihull and surrounding area.We also provide domestic and commercial carpet cleaning Services at best price. Another method on how to remove blackheads is the use of wax. Although some would Cheap Mont Blanc Pens think that wax can enhance the growth of black hair on the face, this is contradicted by experts. To prove it, most beauticians use wax in their salon whenever customers Mont Blanc Pens UK request blackheads removal service. So if you want experts to do it on your nose, go to a salon. It is the best sharing to me, i like your concept thanks.. Your beautiful work is glowing like star, it’s extraordinary. I was surfing using internet luckily I found your site where I found very interesting stuff from your site. I am very happy to see this page and I enjoy a lot. I have a advice for you just Keep continue your good work quite like this site. Nice job! This kind of blog are always inspiring for peoples and I prefer to read like this quality content and I am so happy to discover a lot of excellent point here in the blog, thanks for publishing your work. I am greatly thankful to you for your nicely written post. It’s much informative and useful and your writing style helped me to read easily. Your blogs and information attracts me to read them again and again. It was very well authored and easy to understand in proper way. Unlike additional blogs that I have read which are really not that good. I had also found your posts very interesting. This is amazing stuff from you. I am impressed with what you've given to us here. This certainly is one of the best things that I've read in a long time. I just hope you will keep providing us with good stuff like this.